One of the most unfortunate parts of the debate on the Caltrain/HSR project on the Peninsula is the lack of accurate information. NIMBYs and other project opponents have already convinced many people that an above-grade solution would be a sort of "Berlin Wall" through the city, and Jim McFall's video reinforces that errant conclusion. The problem is that McFall's video has been the only attempt to visualize what the corridor would look like with above-grade tracks. You can see clearly that McFall's model is misleading on several counts. He has the dimensions all wrong - the structure is higher in McFall's model than is actually proposed, and the catenary poles are too densely packed together. More importantly, McFall's video doesn't include existing landscaping that would mitigate much of the visual impact of an above-grade solution. There are no trees in the McFall video, whereas Mike's video makes clear that trees are indeed part of the solution. Duncan Jones, Atherton's public works director, laid out the town's case for both joining the lawsuit and still participating in the high-speed rail planning process. "We need to hedge our bets," he said. Mr. Jones, a former rail consultant, said that the town's fallback position -- if the route doesn't change, put the high-speed trains in a tunnel, rather than on a raised berm -- isn't as far-fetched as it sounds. The rail corridor in Atherton is lined by expensive homes, and widening it to accommodate high-speed rail would require purchasing swaths of private property. "When (the authority) looks at all of the costs and impacts, they may find out that going underground may be cheaper," Mr. Jones said. A tunnel on the Peninsula would likely follow the same model as the San Jose BART extension, Townsend said, because both areas have soft ground. A high-speed rail tunnel would likely cost somewhere between $100 million to $250 million per mile, compared to less than $100 million for an at-grade system, he said. I have a difficult time imagining that the cost of eminent domain for a few backyards would be $100 million. I am also skeptical of the lowball cost of an HSR tunnel that Townsend offered, but even if these estimates are accurate, it represents a doubling of the cost of building on the Peninsula. Such is the fact-free nature of the debate on the Peninsula, unfortunately. Let's hope Mike's more accurate animation gets spread far and wide, and that people on the Peninsula can actually make informed choices about the Caltrain/HSR project. Besides presentations from the feds, there was one from Amtrak's VP Policy and Development, Stephen Gardner, who emphasized that Amtrak wants to be THE national HSR operator. He also said that expanding state partnerships is "Amtrak's future." Will Kempton, Mehdi Morshed, and Bill Bronte acted as the regional presenters, making the public case for California to receive stimulus funds based on the obvious success and maturity of California's passenger rail programs. Their PowerPoint also had nice maps showing CAHSR integrated with each existing Amtrak California corridor, as well as all three. Yet, there was no illustration of long-distance routes, regional rail systems, or Thruway motorcoach connections. So the visualization severely minimized the true reach of the state passenger rail network. The Surfliner route north of LA looked like an errant finger, with San Luis Obispo positively orphaned. This, of course, has no relation to reality, with the existing Thruway connections to Hanford and the Bay Area, as well as the Coast Starlight and the future Coast Daylight. It's this lack of emphasis on statewide connections on the part of the HSRA that leads to situations like Pete Rodgers of SLOCOG opposing Prop 1A supposedly because he didn't think there was anything in it for SLO. Even if the $950 million for feeder rail and transit improvements didn't exist, he'd still be wrong. Representative of LA County MTA: With the billions of dollars LA County voters approved for new transit projects in Measure R, why can't MTA use future HSR connectivity benefits as part of cost-effectiveness calculations for FTA New Starts applications? Why aren't FTA's criteria more holistic? Rae: "We've talked more with FTA in the past 6 months than [we probably did] in the past 15 years." FRA and FTA are aware of such issues and will discuss them more moving forward. Jason Lee, San Francisco MTA: With so much focus on cost, won't HSR grant applicants cut corners and shy away from key projects like the $1 billion Transbay extension? Rae: We're "struggling" with how to handle such megaprojects, of which there are many across all modes, that demand huge resources concentrated in very small project areas. Some of these issues could be addressed in the transportation reauthorization bill. Criteria for numerous federal transportation grant programs could conceivably evolve. Representative of International Brotherhood of Electrical Workers: Union Pacific is grappling with Positive Train Control, which system is best, and how to implement it. Shouldn't the feds lead the charge for one interconnected PTC system? Rae: FRA and the Rail Safety Advisory Committee are working to support the federally-mandated effort for a national PTC standard. We hope that PTC will be as interoperable as other standard railroad equipment. Gardner: Interoperability is in the law (S.294, the Passenger Rail Investment and Improvement Act [PRIIA], the Amtrak/passenger rail reauthorization and rail safety bill that passed last year). Train control will be a critical issue as we develop corridors that exceed 79 mph. IBEW Rep.: UP gave the impression that they didn't know about the interoperability requirement! Paul Dyson, President, Rail Passenger Association of California and SW Division Leader, National Association of Railroad Passengers [Disclaimer: I, Matt, serve under Paul on the NARP Council]: There's a lot of talk of partnerships today. Look at the three providers of passenger rail in Southern California: Amtrak, Metrolink, and Coaster are crummy partners [along the Surfliner route], with passenger-unfriendly schedule coordination. Who's to say states like Arizona or Nevada would ever be willing to work with California as regional "partners" in HSR development, as FRA is encouraging states within regions to do? Rae: "It is not an easy conversation." But there's nothing like competitive grants to provide an impetus for partnership. "There's not nearly enough money to go around," but best practices in multi-state compacts will emerge from this process. Representative of Brotherhood of Railroad Signalmen: Amtrak is mandated to be profitable; will HSR operations be? Nissenbaum: Capital subsidies will be required, but it's the responsibility of applicants to account for operating expenses. Amtrak or other operators will seek assurances so that they're not exposed to any risk of operating losses. Gardner: The profitability clause is gone from Amtrak's mission due to PRIIA, which did stipulate that Amtrak must still minimize the need for federal coverage of their operating losses. States must also cover the losses of any new services. Rich Tolmach of California Rail Foundation (and plaintiff in the lawsuit seeking to invalidate CHSRA's EIR): Will the same FRA safety standards still apply to new high-speed equipment? Nissenbaum: Absolutely, yes. We will need to create new standards for equipment that operates about 150 mph, since they don't currently exist. Rae: FRA Administrator Joe Szabo isn't here today because he's touring European HSR equipment, seeing how they achieve both efficiency and safety. Ryan Stern, State Representative, National Association of Railroad Passengers: Given the moribund state of the domestic passenger rail supply industry, how do we create an environment that allows for ongoing production of rolling stock, so that cars can be purchased quickly and affordably? Gardner: This falls under the work of the PRIIA-mandated Next Generation Corridor Equipment Pool Committee [which is developing national standards for various types of passenger rail cars]. But we do have to live in the world we have now. Rae: The White House is in active talks with our domestic industrial manufacturers to retool underutilized production capacity. Matthew George, Caltrans: Do Amtrak's agreements with host railroads provide for HSR? Gardner: They apply at any speed, hypothetically. But we'll work collaboratively with our partners and not just "show up" with high-speed passenger trains intermingling with slow freights. George: How much can you rely on those agreements? Nissenbaum: You can't; there must be operational agreements specific to each service. But "master agreements" can be a starting point. Beverly Mason, AECOM: What is FRA's policy on adapting European and Asian HSR trains to domestic use? Rae: "We will not compromise our safety record." But new technologies are being explored. Sealed HSR systems especially could support more exotic equipment. 1. What does success from a national perspective look like in 2 years, 5 years, and 10 years? How do we measure success? 2. What factors are critical for implementation of the program? What is the role of the federal government, states, and others? 3. What does your region need to succeed, in the short or long run? All groups wrote their ideas on worksheets, which were ultimately collected. The FRA is expected to make the presentations given at the meeting available on the web "at some point in the future." Robert Cruickshank and I have decided to fiddle with the blog layout in an effort to improve its user-friendliness. The text field for posts and comments is now wider, but anyone with a monitor resolution at least 1024 pixels wide should still be able to view the entire page without having to scroll horizontally. We've reduced the number of recent posts on the blog's home page from seven to three to improve download times, especially when a recent post includes multimedia elements, e.g. Google Maps or Youtube videos. The Blog Archive was moved up to the top of the sidebar on the right. Only the top level, i.e. the years, are shown by default to avoid pushing everything else down too far. To view older posts, please click on the little triangles to open and close the hierarchical index. Just below it, we've added the new search widget Blogger has kindly made available. For those would like to become a follower of this blog, we've added the widget for that at the very bottom of the sidebar. There's a choice to follow publicly or privately and you can stop following at any time. Followers will be notified of new posts on their Blogger dashboard. We would quite like to use a suitable background drawing or photo for a new header that is not subject to copyright or made available to us by permission. The preferred dimensions are 920-960 pixels wide by 80-120 pixels high. A drawing should be in GIF, a photo in JPEG format with 50-80% quality to keep the file small. The text "California High Speed Rail Blog" has to be prominently superimposed on the image, either in a suitable application or else using Blogger itself. The subtitle presently in the header will probably end up below the image or else be removed altogether. A drawing could feature the blue-yellow-white color scheme adopted by CHSRA but not echo the Authority's logo - this blog has no official affiliation with that state planning body. Neither photo nor drawing should include the logo of any railroad operator, foreign or domestic, nor should any train shown be clearly recognizable as a product of any particular train vendor. We'll keep looking for appropriate options, but if you have a good image that meets the above criteria, that would be very welcome indeed. Please send it via email to Robert Cruickshank at his last name dot gmail dot com no later than June 15, 2009. If we end up with multiple good candidates, we'll publish a post later this month with a poll so the readership tell us which they would prefer. Since internet polls are easily skewed (or skewered, Stephen Colbert-style), we'd also take the comments into considerations. In any event, due credit will be given to the creator of any contributed header image that appears on this blog. Meanwhile, we'd appreciate your feedback on the changes we've made so far. Tomorrow, Thursday May 28th, will see two meetings on the high speed rail project. I can't attend either of them, but hopefully you can! As we begin to implement President Obama’s vision for developing a cohesive national intercity and high-speed passenger rail network. This vision was set forth in FRA’s Strategic Plan for High-Speed Rail (HSR) announced by President Obama, Vice President Biden, and U.S. Transportation Secretary LaHood, and sent to Congress that same day on April 16, 2009. The workshops will be led by FRA Deputy Administrator Karen Rae or myself. Through these workshops, FRA is reaching out to the rail community in seven regions across the country to seek your input on the Interim Guidance we are required to issue on or before June 17, 2009, for the $8 billion in grant funds provided by the American Recovery and Reinvestment Act of 2009 (ARRA) for the high-speed rail corridors program, intercity passenger rail grants, and congestion grants. The workshops will enable FRA to discuss the HSR Strategic Plan with key stakeholders such as state departments of transportation, regional planning authorities, metropolitan leaders, associations and labor groups (under the ARRA, these workshops exclude the participation of lobbyists). We seek your input not only to provide us with your regional vision of high-speed and intercity rail networks, but to enable stakeholders to focus on the critical factors that will make this program a success for generations to come. In addition to participating in the workshop, I am inviting you and other members of the public to submit written comments to FRA by June 5, 2009, on issues that should be addressed in the Interim Guidance and specific recommendations on the criteria to be used in evaluating grant applications. FRA has created a public docket (Docket No. FRA-2009-0045) for the receipt of written comments. Please visit FRA’s Web site at: www.fra.dot.gov/us/content/2236 for information regarding the various ways in which you may submit comments to the public docket. Please note, additional sessions to aid states with the mechanics of applying for ARRA funds will be scheduled after these workshops, as will informational sessions for industry, labor, intergovernmental and other interested parties. I look forward to working with you over the coming months to ensure the grant programs funded by ARRA are implemented successfully. The meeting is open to the public, and will be held at the Jennings Pavilion in Holbrook-Palmer Park, 150 Watkins Ave. in Atherton. Atherton officials, and many of the town's residents, have grave worries about the local effects of the state plan to run high-speed trains along the Caltrain corridor that bisects the town. If the high-speed rail line can't be rerouted to avoid the town, Atherton officials would rather have the train run through a trench or tunnel, instead of on an elevated berm. The scheduled speakers at the meeting are: Mike Garvey and John Litvinger, public outreach consultants working for the California High Speed Rail Authority; John Townsend, executive vice president of Hatch Mott Macdonald, a leading tunnel-engineering and construction firm; Duncan Jones, Atherton's public works director; Gary Patton, attorney and former director of the Planning and Conservation League; and Jim McFall, who will present a digital model of elevated high-speed rail tracks going through Palo Alto. I'm really curious about this "digital model" that will be shown. Is it going to be an accurate representation of what an elevated solution could look like, or is it going to be a biased depiction of some kind of Berlin Wall? I hope that the CHSRA has been able to generate some more accurate and realistic digital images of their own. Update: Thanks to Clem in the comments who links to Jim McFall's video - videos that put the worst possible spin on this, making the HSR grade separation look like an Orange County freeway. Additionally, I'm curious what the tunneling exec will have to say. Will he explain the price tag of a tunnel? Will Atherton residents have their checkbooks and credit cards ready to go to pay the multi-billion cost of such a tunnel? Only one way to find out - go to the meeting! If anyone does attend, and wants to write up their impressions of the meeting(s), I'll be happy to post it here unedited. Will the California Farm Bureau Join the 21st Century? As the state's High-Speed Rail Authority plans an 800-mile high-speed rail system that will help alleviate congestion on roadways and transport passengers from San Francisco to Los Angeles in a little over two and a half hours, California's agricultural landscape is likely to change dramatically. An estimated 300 miles of the project is expected to go through the Central Valley—one of the most productive farming regions in the world. "There has been a real concern by agriculture about the route that the California high-speed rail project ends up taking and how it is going to impact those properties, as well as properties adjacent to the proposed project corridor," said Andrea Fox, California Farm Bureau Federation governmental affairs legislative coordinator. "While the routes of the project are being planned, we cannot lose sight of the many benefits of California agriculture, not only to support the state and nation economically, but to feed people locally and around the world." This doesn't really make sense. The ROW they're looking at is very narrow, and follows an existing rail corridor. Sure, some farmland will be lost, but the amount we're looking at is a tiny percentage of the overall acreage in the San Joaquin Valley. It's not like this thing is a 12-lane freeway. Further, it's totally unclear how HSR would itself have a negative impact on farmland or farmers. It would free up valuable freight rail space, and make it less necessary to have to widen either Highway 99 or Interstate 5, projects that could also wind up taking farmland. Merced County Farm Bureau Executive Director Diana Westmoreland Pedrozo foresees this project as creating real problems for the future of agriculture in the Central Valley. "CFBF supports the concept of mass transit, but we must insist on protecting agricultural land and preventing urban sprawl. Because our success depends on a healthy environment, we are committed to solutions that work," Fox said. "Considering California's projected $21.3 billion budget deficit and the existing $100 billion bond indebtedness, coupled with the need for new water projects and improvements to existing transportation and other infrastructure, we are concerned about cost-effectiveness of this project." The irony is that we who support HSR are some of the strongest supporters of preserving agricultural land and preventing sprawl. As we've explained numerous times on this blog, HSR is a much better way to limit sprawl, as it encourages in-fill transit-oriented development as opposed to sprawl. I have also repeatedly expressed my belief that the state should push through land use rules strictly limiting sprawl in critical agricultural areas like the San Joaquin Valley, the Sacramento Valley, the Salinas Valley, the Imperial Valley, Ventura County, and other places. The rest of Andrea Fox's comment there shows that like many other local Farm Bureaus in the state, the California Farm Bureau is hopelessly locked into a 20th century model of how state infrastructure should look. They seem to want more freeways and roads, yet don't understand how that brings more sprawl than HSR would. Whereas HSR would channel population growth to existing cities, freeways would channel it to exurbs. Instead of making Fresno more dense, the Farm Bureau seems to support letting Los Banos sprawl all over the place. It makes no sense from the stance of preserving agricultural land. California does have a water problem. But that problem is driven partly by global warming, which is causing less rain to fall in the state. Shouldn't the Farm Bureau, whose members are by far the largest consumers of water in the state, be supportive of methods to cut down on carbon emissions and slow the rate of global warming so as to slow the decline in average annual rainfall? Further, the San Joaquin Valley has some of the nation's worst air quality. Surely the Farm Bureau supports clean air for its workers, its crops, and its neighbors? The California Farm Bureau is picking a fight with the wrong people. HSR and its supporters are allies of California agriculture, not its enemies. It's time the California Farm Bureau embraced sustainable and carbon-neutral transportation. In return we will be more than happy to embrace their effort to stop sprawl. They have nothing to lose and everything to gain. Construction crews could begin work on a proposed high-speed rail line to Las Vegas as early as next year, executives with the company behind the project said. "The strong need for the project is clear and obvious," said Andrew Mack, vice president of Las Vegas-based DesertXpress Enterprises. DesertXpress reports that construction and other start-up costs will total $3.5 to $4 billion. and that the line could be built in four years. The midpoint fare price is projected to be about $50. If that pencils out, then this would be a pretty damn ideal solution. The $4 billion question is "will Southern Californians drive to Victorville and hop a train to Vegas?" and DesertXpress is confident that their ridership studies prove the answer is "yes." For everyone's sake I hope they are correct. My gut says they are - the ability to avoid the massive traffic jams on Interstate 15 on holiday weekends like this would be compelling. People would like the ability to relax on the trains, maybe get some work done as they approach their Vegas vacation, etc. Victorville mayor pro tem Tom Rothschild, a Desert XPress supporter, said a high-speed rail line can be built in the near future. He thinks Maglev, which uses magnetic force to levitate and propel trains, is not yet practical. "Maglev is great, don't mistake me. I think it's the greatest technology for the next half of this century," Rothschild said. Yet for some reason maglev in the U.S. has yet to be widely embraced. It can be understood why this is the case in Europe, given its intricate, interconnected network of traditional and high-speed passenger trains with maximum speeds of 180 mph. In this country, however, we have the advantage of starting fresh. We can paint the high-speed rail picture any way we want to. And, given the lack of a preexisting passenger rail infrastructure and great distances between U.S. cities (especially in the West and Midwest), the advantages of safe, environmentally responsible and state-of-the-art 300-mph maglev technology should be obvious. The California-Nevada Interstate Maglev Project, which our administrations helped spearhead through local public-private partnerships, is one such effort that deserves the nation’s support. I'm no expert on Nevada politics, so I don't quite know what influence former governors Kenny Guinn and Bob Miller still have in the state. But combined with Senator Harry Reid's big push for maglev, it suggests that while DesertXpress seems to be the more financially and technically viable solution, maglev still has the key political support. Which is a ridiculous situation. Maglev isn't going to get built on the LA-Vegas corridor. *If* the US were to ever embrace maglev I cannot imagine it would happen on that low-population, low-importance corridor. I could see it happening in the midwest or on the Acela route. Not here. The sooner Nevada's political leadership can line up behind the DesertXpress plan, the better we will be. At the same time, city officials have been getting a plethora of free assistance from a group of city residents who, over the past few months, immersed themselves in rail-related issues. One of the group's leaders, Sara Armstrong, has been reaching out to neighborhoods both inside and outside Palo Alto to strengthen the citizen coalition. Residents Rita Wespi and Elizabeth Alexis have been tracking the web of rail-related bills passing through the state Capitol, while Nadia Naik has joined Councilwoman Yoriko Kishimoto in advocating a "context-sensitive solution" to the design of the new system. We will be doing the same kind of work in tracking rail-related bills - if anyone wants to help, drop me an email (my last name at gmail). But the part that really stood out to me, as you can tell by the title of the post, is Kishimoto's "context-sensitive solution." Just as with Redwood City and "stakeholders" how you actually define these terms matters a great deal. What is the "context" that Kishimoto describes? Is it a very narrow notion of context, including the 1/4 mile next to the Caltrain ROW? Or is it a holistic notion of context, including the community as a whole, the economic, environmental, and energy context? Do finances play a role? As the news this week shows, there isn't exactly a whole lot of money lying around to build a tunnel. Or are those things arbitrarily excluded from Kishimoto's notion of "context"? The residents recently formed a new group -- Citizens Advocating Reasonable Rail Design -- which lobbies for more transparency for the $40 billion project and for the context-sensitive approach, which requires outreach to stakeholders before development of a transportation project and a focus on local context when designing the project. So what looks to be the case here is "local context" which is probably defined as "whatever a small group of Palo Alto residents who bothered to organize the group want the HSR to look like." I would be pleasantly surprised if finances, job creation and ability of ALL residents to afford travel, impact on air quality and global warming, and on energy independence are included as part of the "local context." If those things are not included, then this "context-sensitive solution" will not be context-sensitive at all, and it certainly would not qualify as reasonable rail design. Dominic Spaethling, project manager for the San Francisco-to-San Jose segment of the proposed line, said the rail authority and Caltrain are both sensitive to the concerns of the various communities. But he warned that cities could have different ideas for how to collaborate with the rail authority on design ideas. "It's important to acknowledge the need for collaboration in design, but it's not a 'one size fits all' situation," Spaethling said. "Charrettes may be fine for Palo Alto, while other cities may have other approaches." On Monday, the City Council attempted to make this dialogue smoother by adopting a set of guiding principles for its newly established ad hoc committee. The committee, which includes Kishimoto and councilmen Pat Burt and John Barton, is authorized to speak on behalf of the full council on rail-related issues whenever the city's input is needed on short notice. The principles proclaim the city's support for consideration of alternative alignments (other than the Caltrain right-of-way). They also call for a collaborative approach to urban design, more transparency in the design process and an economic study that would help determine which design alternatives are feasible. Councilman Greg Schmid, who wanted the principles to explicitly state the city's concern about elevated trains, was the only council member who voted against adopting the principles (Barton and Vice Mayor Jack Morton were absent). Hey Greg: if you're going to have a process where all implementations are fairly studied, you can't stack the deck by saying "we hate elevated trains." Of course, the rest of Palo Alto's work is merely an effort to stack the deck using more subtle means. It's entirely possible that Kishimoto's efforts are well-intentioned and meant to get HSR built in a way that's acceptable to both Palo Alto and the state they are still a part of. But the way the efforts are set up and defined strike me as being too much of an effort to force CHSRA and Caltrain to accept a tunnel. And in the absence of a reasonable discussion of finances, it is difficult to take seriously those that demand a tunnel. China plans to create the world's largest high-speed rail network. The Chinese Ministry of Railways is planning to buy 1,000 high-speed trains within the next few years. The current order from Siemens (SI) includes the first trains to serve the new high-speed line between Bejing and Shanghai. German train producer Siemens has inked a $1 billion contract to build 100 new high-speed trains for China. The company's Velaro train has a top speed of 218mph (350.84km/h). A typical train will have 16 cars and carry more than 1,000 passengers. With a total length of more than 1,300 feet (396.24m), the new trains will be the world's longest single high-speed units in use, according to Siemens. By the end of the first quarter 2009, the approved Chinese railway investment exceeds $292 billion including more than $175 billion investment in the process projects. The data shown in the recent “Research Report on the Investment in Chinese Railway Transport Industry, 2009” indicates that China plans to construct 40-thousand-kilometer railways with the total investments of over $730 billion by 2012. This is a smart strategy for China, which is a major oil exporter and has to get that oil from countries that are more closely allied to the US than to anyone else. China also has a need to provide sustainable transportation for its population, and a need to provide jobs to its people during a consumer-led recession. Obviously there are differences between the US and China - they have huge currency reserves they can spend on this, whereas the US has huge private, concentrated wealth reserves (thinking of the richest 5% of the population or so) nobody really is willing to touch. But if we have the capacity to blow a trillion on a bank bailout that won't really provide long-term economic growth, surely we can spend more than $13 billion on HSR. Right? Dithering and doing things half-way are not among the national character flaws that might be pinned on the Chinese. One has the sense that if that country ever gets serious about greening up, it will do it with a rapidity and effectiveness that will make western nations look downright silly. And, perhaps, they’re already at it with this plan to build the world’s largest high-speed rail network. As of March 31, China has committed $259 billion to the project, and plans to spend nearly a half trillion dollars more in the next three years, boosting the total investment to $730 billion by 2012. A little context here: The US–a country with a per capita GDP about 16 times that of China–has set rail as a national priority and has committed… $13 billion. Or, about 2 percent as much in China. This, of course, is in a place where it costs a hell of a lot more to get anything done. Of the Chinese investment, at least $1 billion is going to the German conglomerate Seimens for the purchase 100 high speed train sets. They will be, on average, 16 cars–or 1300 feet–in length, capable of carrying 1000 passengers, and capable of traveling 218 mph. Moreover, they will be running on tracks designed to accommodate that speed. Unlike, say, the Acela. Ultimately, the Chinese government plans to buy 1000 high speed trains to run on a track network of around 25,000 miles. Why, oh, why do we have such difficulty approaching serious projects with the required seriousness in this country? Sure, sure, China doesn't really have labor or environmental standards, or even democracy. We have each, rightly so, and that adds some time and cost to massive infrastructure projects. The tradeoff is worth it. But those differences don't change the fact that China's moving to better position itself for the 21st century than the US. At least we here in California have stepped up to approve our HSR project, the only thing the US has to offer that comes anywhere near China's plans. Lest we forget, HSR is seen around the world as a strategic necessity for 21st century prosperity in a global economy. Americans aren't trained to think in those terms, since we found prosperity and global leadership with a 20th century economy based on oil consumption, sprawl, and cars. It's difficult to get people out of that mindset and recognize that times have changed and a new basis of growth and prosperity is needed. Perhaps China's setting of the bar can inspire Americans to catch up - to California and to the rest of the industrialized world. California’s voters are complicit in their state’s collapse. They elect and re-elect the legislators off whom public employees unions batten. Also, voters have promiscuously used their state’s plebiscitary devices to control and fatten the budget. Last November, as the dark fiscal clouds lowered, they authorized $9.95 billion more in debt as a down payment on a perhaps $75 billion high-speed rail project linking San Francisco and Los Angeles — a delight California cannot afford. As you can tell, facts and evidence no longer mean anything to Will - there is no basis for the claim that HSR will cost $75 billion. If "perhaps" is the only justification to toss out numbers, then I think HSR will "perhaps" cost $1.50. I mean, really. WTF. Of course, Will's argument is deeper. He claims that HSR is unnecessary (a "delight") that we "can't afford" and its mere presence on the book as a partly-funded proposal is to him further sign of how California got into the crisis. So, here we go again, with arguments that to me were decisively won by our side in 2008. I won't completely repeat myself - go read The Cost of Doing Nothing is Not Zero and Prop 1A and State Bond Debt for starters. If we don't build HSR, that does NOT represent savings to the budget. HSR is itself savings. The cost of expanding airports and freeways to meet the expected future demand has been estimated to be anywhere from $80 to $160 billion. HSR can meet much of that demand for much less of the cost. Further, it does so by providing sustainable transportation, saving money to workers and businesses by liberating them from the vagaries of oil prices. HSR is absolutely necessary to economic recovery. Our budget mess isn't the product of overspending but of the worst economic crisis in 60 years. If it were up to folks like Will we'd still be in the Depression - massive public works projects like HSR provide short-term stimulus and long-term economic growth. The 100,000+ jobs the construction will create will pour money into the state's economy and into the state's treasury. On the converse, NOT doing public works like this will help create a downward spiral that will leave California in perpetual crisis. HSR does NOT come at the expense of any other budget line item. It's not a matter of firing teachers to build trains. This is because the money for HSR is going to come out of bonds and federal funds. Some might say that's disingenuous since we have to pay for the bonds somehow. But the point I would make is that HSR's costs are amortized over 30-40 years. Teachers need to be hired and paid now. Cutting HSR won't save other services (especially when the current amount of spending on HSR is barely $100 million, whereas the budget deficit is $25,100 million). The problems with the ongoing budget deficit have to be resolved through a mixture of new taxes and economic stimulus. Cutting stuff will actually make the problem worse. It's not that we support HSR because we are train junkies. We support it because it is an essential part of our economic recovery and vital to providing long-term prosperity in the 21st century. We should not be surprised when the usual suspects and, yes, HSR deniers like George Will use the budget mess to try and push through their usual attack on government and on passenger rail. But we can and should push back against their nonsense. Simonelli hopes the new Evolution model could mark the beginning of something else — the return of GE Transportation to the passenger train business. GE, which built more than 300 Genesis model passenger locomotives during the 1990s, wants to be a player in that industry, Simonelli said. Although Monday marked the official unveiling of the new locomotive, 25 of them already have been delivered to Burlington Northern Santa Fe, which is helping GE Transportation continue long-term testing. This is a smart move from GE's perspective, as the collapse of the US auto industry has politicians in both parties looking for a new manufacturing base. Anything GE can put together on HSR in particular would get a LOT of favorable attention from the Congress. That being said, the last thing we'd want is a political decision about HSR power and rolling stock. The trainsets we use have to be of a high quality, and there are a lot of excellent off-the-shelf technologies out there. If we can get Siemens or Alstom to commit to building a final assembly plant in CA, then it would go a long way in leveraging GE to make similar commitments. Redwood City has been one of the better local governments on the Peninsula when it comes to dealing with the HSR/Caltrain project, unwilling to follow Palo Alto, Menlo Park and Atherton down a NIMBY path of trying to impose unworkable changes onto the project, and certainly unwilling to threaten outright opposition to it. And yet Redwood City's staff are still capable of framing the debate in rather skewed terms. Tonight the Redwood City Council is going to discuss a plan for public outreach (PDF) on the HSR/Caltrain project. It's nice to see a proactive approach to engaging city residents, rather than Palo Alto's quick cave to a small number of HSR critics. In the comments on recent Peninsula-related posts here, there has been a robust discussion of NIMBYism, how to challenge it, whether it's a serious threat to the HSR project or is something we're giving too much attention to - the squeaky wheel getting the blog's grease. What the Redwood City plan suggests, though, is that the problem is with how the Peninsula cities define "stakeholders" in such a vital project. Redwood City's approach provides a too-narrow definition that excludes the most numerous group of stakeholders of all - the thousands of city residents whose lives will be improved, who will save money and time and be freed from the dangers of at-grade diesel trains by the HSR/Caltrain project. 1. Overarching Principle: From a community relations standpoint, the development and implementation of the HSR/Caltrain electrification facilities must take place with profound attention to the interests of the surrounding communities, stakeholders, and sensitive audiences, offer an augmented level of community outreach, communication, and involvement, and minimize negative impacts and effects on the communities in which the project will operate. It's not that I object to the inclusion of specific groups or individuals here. Instead it's the premise, that privileges those next to the alignment at the exclusion of those who are not. Don't other Redwood City residents deserve consideration? Even if they don't currently use Caltrain, but might use an electrified Caltrain or use HSR? Redwood City and Caltrain wouldn't be doing their job if they didn't find a way to do outreach to those near the line, but neither should they stop there. A full picture of the community's thoughts, and the fairest possible assessment, can only be gained if the city as a whole is involved. It's not right that those nearest the line get more consideration. Everyone has to live with the effects of HSR/Caltrain, whether it's built or not. This is true of drivers, pedestrians, and so on. Yet we live in a state where our public review process, and our community outreach process, is skewed toward those who live near a proposed piece of infrastructure, often to the exclusion of everyone else. In extreme cases, that would be good. When the Century Freeway (Interstate 105) was built, it destroyed numerous and entire neighborhoods. That's a classic case of where the interests of those most directly impacted by infrastructure should be emphasized. And yet when you're talking about rebuilding and improving an existing rail corridor, you're not talking about people losing homes, or whole neighborhoods being plowed under. Redwood City's proposed public outreach plan is a good start. But for it to be an effective plan, it needs to cast a wider net, and ensure that the voices of the city's numerous HSR supporters are not unfairly excluded from the process, as they seem to have been next door in Menlo Park, Atherton, and Palo Alto. Been an unusually busy weekend for me, and there doesn't seem to be a whole lot happening on the HSR front (still looking into details about the recent Senate Budget Subcommittee hearing). So use this as an open thread. • Ray LaHood tells Midwest "you need a czar" to coordinate HSR efforts. I think it runs deeper than that - there has to be extremely strong commitment from the top levels of state government. California has a kind of HSR czar - Quentin Kopp has a strong position as chair of the CHSRA board - but he lacks the support in Sacramento that he needs to get his job done. Some may lay the blame for that at Kopp's feet, but I'm not seeing anyone in Sacramento really step up to help HSR either. • Florida HSR was given a big boost by Ray LaHood's recent comment that FL and CA are "in the lead" for HSR funds. The FL HSR Commission met last week to decide what to do about their newfound (and judging by the articles, unexpected) position as likely HSR stimulus recipients. Back in '03 they had selected a bid from Fluor-Bombardier, but Jeb Bush's opposition helped kill the plan. The FL HSR Commission decided to wait on whether to consider the Fluor-Bombardier bid still alive or whether to solicit new bids. In the wake of the recent scoping meetings for the DesertXpress plan, the Las Vegas Sun has offered a interesting overview of the status of Vegas HSR plans. Despite the silly "train wreck!" framing (really? are LV Sun editors the first people to ever think of that for a story on passenger rail?!) the article actually does a decent job of laying out some of the issues the scoping process has revealed. Although the skeptics have good reason to question whether passengers would make the drive to Victorville to board a train, it is the best place to put a train station when you’re on a budget as DesertXpress is. The developers are no dummies. They know it would make more sense to take the train line into the Los Angeles Basin. But the cost of taking the line down Cajon Pass is as steep as the highway grade and the company is content to finance the route to Victorville and expand to L.A. later. The draft environmental impact statement has independent ridership studies that say Southern Californians would drive to Victorville to board a train to Las Vegas. The independent analysis was ordered because they, too, were skeptical about that. I can't say I am terribly familiar with this independent analysis. Given the long travel times that can be experienced on Interstate 15 during the weekends, a high speed train would be a compelling option even if you had to park at Victorville. DesertXpress's logic that once the train is open and ridership grows, there'll be money and interest to connect it to the LA basin strikes me as sound. The article didn't mention the possibility of a cheap and easy extension of the DesertXpress route westward to the California HSR station at Palmdale, but that would pretty easily solve the problem of how to get people to the DesertXpress trains. Meanwhile, there’s the maglev. The technology is in use in China and American Magline Group, a Los Angeles-based company, wants to introduce it to Americans between two of the nation’s greatest tourism destinations, Las Vegas and Disneyland in Anaheim. Because millions of people visit Las Vegas and Disneyland every year, they would be able to see tomorrow’s train transportation today. That’s one of the reasons there’s even a conversation about using federal stimulus money to move the project forward. Because there’s possible government money involved, maglev developers aren’t as concerned about costs and are making plans to take the line all the way to Los Angeles. But the maglev environmental impact statement is running behind the DesertXpress proposal. A meeting similar to the one that took place last week probably won’t occur for at least a year. By then, DesertXpress could have permission to move ahead with design and construction. The maglev and DesertXpress technologies aren’t compatible, but they both want to use the same right-of-way. I will go out on a limb - a low, thick, sturdy limb - and predict that the maglev proposal will be dead as a doornail by summer 2010. The costs are absurd. The federal government will not be in a mood to fund it, especially since no maglev project has ever been successful on this scale. If there's any chance that spending on the maglev could negatively impact federal funds for the SF-LA train, maglev will be tossed out the window quicker than you can blink. Further, DesertXpress will be closer to a shovel-ready position. Not even Harry Reid, one of the most incompetent majority leaders in the history of the Senate, will be able to save maglev by that time. Count on the airline lobby to oppose federal funding for high-speed train transportation. Funding for a next-generation air traffic control system is so far behind that some wags are calling it a “now-gen” instead of a “next-gen” system. Airline lobbyists resent that tax money is being considered for trains when a satellite-based air traffic control system that would make air travel safer and more efficient languishes. A US Airways executive recently asked me about the public sentiment for high-speed trains between Southern California and Las Vegas and when I told him there seemed to be some renewed interest, he told me the airlines would probably put up a fight. He added that US Airways in particular would fight a Las Vegas-Los Angeles train because his company flies that route. The company wouldn’t mind so much if high-speed rail were considered between Dallas and Houston (where rival Southwest carries most of the air traffic) or Chicago and New York (where competitors American, Delta and JetBlue battle for market share). I would caution taking this statement too broadly. Southwest no longer opposes a Texas HSR project, and no airline has raised an objection to the SF-LA project. In fact, as we chronicled extensively here last year, the big airlines are looking to get out of some of the short-haul routes. US Airways could fight a Vegas HSR line, but they're not exactly one of the most beloved or profitable airlines, so I'm not sure that their opposition alone is going to sink this. If DesertXpress does become the primary candidate for Vegas HSR, which I think it will, then it would be a positive development for the SF-LA HSR project. It would create demand in Southern California for getting the SF-LA project done, especially to Palmdale, in order to link up with DesertXpress. Busy day here, and my train-related thoughts are currently occupied with a meeting this evening at Monterey City Hall on the debate between building light rail or bus rapid transit along the Monterey Branch Line from Castroville to Monterey. I'll be speaking in favor of a light rail solution, as that's likely to generate more riders and more transit-oriented development, but we'll see what the rest of the community's reaction is. The ROW is already publicly-owned. I'd like to think my city isn't populated by the same kind of NIMBYs we've seen on the Peninsula, but we'll see. Not much happening around the HSR-sphere today. There has been an interesting discussion about the mid-Peninsula station in the comments to the previous post. Arnold Schwarzenegger is busy trying to scare voters into backing his May 19th budget ballot propositions. Whether they pass or fail the state is still facing a multi-billion dollar budget shortfall, which may generate pressure to cut the CHSRA's budget, and will make it more difficult to sell the Prop 1A bonds. Democrats are busy lobbying Congress to pass legislation allowing the federal government to back California's short-term cashflow borrowing, which would greatly help matters. As we've mentioned here before, the $8 billion HSR stimulus is just a first step toward a long-term solution of how to fund the development of a faster and more robust intercity passenger rail network in the US. The real money comes in the quintennial Transportation Bill, which is due for renewal this year. President Obama and many Congressional Democrats see that bill as the place where the nation's transportation priorities can finally change, away from massive subsidies to roads and starvation diets for rails. It's perfectly timed to take advantage of a popular new president who has majorities in both houses of Congress - rather than wage an election year battle or deal with a Congress controlled by the other party, Obama can work with allies to craft a new model of funding transportation. New Federal Transportation Structure: Comprised of four elements: National Transportation Priority Programs (including planning and maintenance backlog); Geographically-Tiered Multimodal Access Program (state, regional, and local); Programs to Complete the National Transportation System (intercity travel, green freight, and "projects of national significance); and Innovation Incentive Programs to boost sustainable and smart growth. Possible New Revenue Sources: Sales Tax; Gas Tax; Oil Tax; Container and Customs Taxes. What I really like about the T4America proposal is it emphasizes performance targets that are set up to ensure the development of a passenger rail infrastructure in order to achieve goals we should all be embracing (Peninsula NIMBYs too): reducing dependence on oil, cutting carbon emissions, and saving people money. The whole plan looks quite sensible and workable to me. • The outline calls for "transit equity." Right now the feds pay 80 percent of highway projects and 50 percent of transit projects. That would change. • It would create DOT agencies focused on a "national strategic plan" and on "mega-projects." • "DOT's 108 programs [will be consolidated] into four "major formula programs": critical asset preservation, highway safety improvement, surface transportation program, and congestion mitigation and air quality improvement." • The document seems to call for more transparency with transportation data. Oberstar has also said that the Transportation Bill has to fund from $400 to $500 billion worth of projects over the next 5 years. If either his approach or T4America's similar approach are successful, we could have a clear source identified for HSR projects. The funding may be explicitly earmarked for HSR or it might be set up to ensure HSR gets it through the program allocations and targets. The House is likely to produce a very good bill. The Senate, not so much. As has become clear in 2009, the US Senate is where good and sensible ideas go to die. Controlled by right-leaning Democrats in the pocket of banks, large corporate donors, and who are otherwise in thrall to a 1990s-style "pro-business" neoliberal agenda, Senate Democrats are busily planning to water down health care reform, Obama's budget, and the Transportation Bill as well, just as they watered down the stimulus. The Senate is also considering raising the tax on diesel, changing exemptions to the gas tax given to certain groups, taking a percentage of customs duties, relying on private finance, and charging drivers fees based on Vehicle Miles Traveled, she said. The bill's authors, though, have rejected attaching a small device to cars to measure Vehicle Miles Traveled, Boxer said. "We're looking at options. Are there ways for people to -- an honor system, when they register their vehicles -- just say, 'This is the miles I had last year, this is the miles I have this year,'?" she said. Like Oberstar, Boxer wants to pass a transportation bill that emphasizes efficiency and consolidates the numerous transportation programs. But she wants to maintain the same relationship between the federal government and states, whereas Oberstar is considering giving the states more discretion in spending. An environmental leader in the U.S. Congress, Boxer said she was finding common ground with Republicans on the Environment and Public Works Committee that she chairs for reducing traffic and congestion. That last part is simply absurd, and I'm disappointed in Boxer for saying it. The ranking Republican on that committee is Oklahoma's James Inhofe, a noted global warming denier and opponent of mass transit. Boxer should feel no need or desire whatsoever to work with Republicans, unless they are willing to accept the values that Oberstar and T4America, as well as President Obama are proposing. Any chance of reforming the transportation bill, which advocates are clamoring for, will require deft political maneuvering to mollify ranking committee member Senator James Inhofe. Several sources said that Boxer's cooperation with Inhofe is simple math. The $312 billion baseline for transportation over six years is insufficient to meet state of good repair needs and set the country on a course for innovation. Minnesota Representative James Oberstar, chair of the House Transportation Committee, has suggested $400-500 billion would be needed, while the American Association of State Highway and Transportation Organizations (AASHTO) and the American Public Transit Association (APTA) argue in their Bottom Line Report that at least $160 billion will be needed annually. In order get from $312 billion to $500 billion or better, Boxer will need to get approval for new revenue streams, which would require a filibuster-proof majority, something she might not get without Inhofe and other reluctant members on the committee. Several interviewees also pointed to Senator Boxer's alliance with Inhofe on an amendment in the federal stimulus bill for an additional $50 billion in highway money as a bad sign. "You have polar bears and glaciers on your website... then throw people back in their cars?" said one official who insisted on anonymity. I'm used to watching DiFi like a hawk. Not so much with Boxer. The rest of the article notes some more discomfort with Boxer's positions, so I suspect we're going to have to target Boxer frequently this summer as the Transportation Bill works its way through the Senate. He’s specifically worried about funding availability in light of the fact that revenue from the gas tax, which pays for highway and transit programs, is no longer sufficient to cover outlays. He called this the “elephant in the room” with respect to infrastructure funding. In short, Warner is saying that he's scared about anything involving fiddling with the gas tax, and that the big bad Republicans might hit Dems on that after a big fight over health care and the budget. What Warner doesn't explain is how 2010 is any better a time to deal with the Transportation Bill, as it would be an election year. This would be so much easier if the US Senate wasn't populated by the timid and the right-leaning. Unfortunately, we're going to have to deal with them if we want a good Transportation Bill and not something that mindlessly repeats the same flawed anti-transit policies of the past. Introducing ultra-fast passenger trains to the Midwest is less important than the need for more frequent service between cities, reliable schedules that beat the time spent driving and rail connections that permit travel across the United States, Amtrak's chief official said Monday in Chicago. True high-speed rail clipping along at 200 m.p.h. or faster would be prohibitively expensive to build on the scale needed to serve the U.S., and such systems work best only when the number of stops are limited, Joseph Boardman, president and chief executive officer of Amtrak, told Illinois lawmakers at a hearing in the Thompson Center on the passenger railroad's agenda. "It's really not about the speed. It's about reduced travel times and more frequency," he told the Illinois House Railroad Industry Committee. "The competitive advantage is with the train." Boardman said plans in the Midwest for trains traveling up to 110 m.p.h. on corridors stretching over nine states make more sense. He said the immediate focus must be on modernizing infrastructure to increase train speeds in the Chicago area that currently are as slow as 5 m.p.h. because of freight-train congestion and antiquated track and signaling equipment. Getting up to even 40 m.p.h. on stretches between Chicago and cities less than 50 miles away, such as Joliet, would be a big improvement, Boardman said. "One hundred and ten is double the national speed limit" of 55 m.p.h. on highways, noted Boardman, who was administrator of the Federal Railroad Administration during several years of the Bush administration. I hate to point out the obvious — something I’ve had to do in the past — but reduced travel times can only be achieved through (a) reducing the distance traveled, or (b) increasing the speed of trains. Since I’m assuming Mr. Boardman wasn’t suggesting that customers simply start taking shorter trips, the only way you can reduce travel times is by increasing speed. So it really is about the speed. Sorry, Mr. Boardman. Mr. Boardman used this argument to inform the committee that it was infeasible to build true high-speed rail (that is, “HSR-Express,” as we’re calling 150+ mph service these days) at the scale needed for the United States because of its high cost, and said that speed improvements to service at 110 mph were more realistic. I have no problem with steadily improving train speeds, nor of course with increased frequency. But we should be investing in much faster speeds along the country’s most important corridors, like San Francisco-Los Angeles or Washington-Boston. Those lines, among others, deserve the same level of rail service as is provided in European and Asian countries, and there’s no reason to think that the U.S. is simply incapable of building them. Whether or not some trips taken by Americans are transcontinental, the fact is that the majority of long-distance trips are made by people traveling between cities 100 and 600 miles apart. Those distances are ideal for high-speed rail. Boardman believes that improvements in Chicagoland can increase speeds from 5 to 45 mph, and that if you can get trains to accomplish 110 mph, you can bring enough people to trains to make it worth your while. But that's the key issue here - "worth your while." Sure, you can get more people to ride a train from Chicago to St. Louis at 110mph, but as much as would drive or fly? And would a 110mph train change travel habits as much as a 200mph train would? If you look at Spain you might get a sense of the answer. Madrid and Barcelona have long been connected by fast trains operated by RENFE above 110mph, but it was only when the AVE was completed to Barcelona-Sants in early 2008 that you started to see a big shift in travel habits away from the airlines and towards the train. Of course, there's about 100 miles difference in the distance between the two cities (Chicago-St Louis is about 300 miles; Madrid to Barcelona is about 400 miles) and that might make some difference. Still, there does seem to be a solid case that true high speed rail - above 150mph - really does make a big difference in terms of ridership. I think Boardman should not be so prejudicial in his comments against that kind of HSR in Illinois or the Midwest, and I hope he doesn't wind up having any influence over the decision about which HSR projects get funded - because here in California, we ARE going to have trains going over 200 mph, and it's the right thing to do. But Scott Witt, director of the Washington state Department of Transportation’s rail and marine program, said that though he and others are focused on the “here and now,” high-speed trains running nearly the length of the West Coast aren’t just a fantasy. “They would go like a son of a gun,” he said. Objections to a border-to-border HSR route are several. The first is that numerous studies have shown that HSR is only competitive with airlines when the route is around 400 miles or so. Beyond that, the travel times tend to be off-putting for many passengers, who prefer the convenience of flying. Of course, that's given present conditions, and spikes in oil prices and other events that could make flying undesirable or costly might change the calculus. The second issue is the geography. Vancouver to Eugene and Redding to San Diego is pretty easy. Eugene to Redding is not. There are a lot of mountains in the way, and the easiest route - the current Coast Starlight route, over Willamette Pass, parallel to US 97 through Klamath Falls, and through the Shasta Lake region - almost totally misses the population centers of Southern Oregon. Constructing a truly high-speed West Coast rail corridor wouldn’t be easy. It would require entirely new rails and a new corridor that smoothed out grades and corners. Picking a route and deciding where the trains would stop would be politically bruising. And the cost could be astronomical. The 1,500-mile line, by some estimates, could cost between $10 million and $45 million per mile to build. Witt said he has been talking with his counterpart in California for about three weeks. An alliance with California and perhaps Oregon would make it easier to leverage federal planning funds, he said. The Olympian didn't do the math, but at $27.5 million per mile (the midpoint of the estimates) that comes to $40.5 billion. Which is about the cost of just building the CA HSR project (SD and Sacramento phases included). So I am not confident in that estimate. Still, as the above quote shows, these conversations ARE happening. As far as I can tell it may be part of an effort by Washington State, which recently cut passenger rail staff at WSDOT, to get a more favorable position regarding the federal stimulus and longer-term federal HSR planning for the Cascades corridor by allying with Oregon and California. Show USDOT that the California project is part of a wider vision for the West Coast, so let's fund stuff in the Pacific Northwest too! I'm all for helping fund HSR along the Cascades corridor. It's a perfect place to implement HSR - most of the Northwest's population lives there, the stations are in the city centers, and in Portland and soon Seattle will be linked by a robust network of local rail and transit. And I'm not opposed to upgrading the West Coast passenger rail corridor. Upgrading the Eugene-Redding corridor where possible to allow for some higher speeds could make it possible for an overnight connection from Eugene to Sacramento, and someone could get from Seattle to LA in about half the amount of time it currently takes via rail. “This is real stuff about moving people, creating jobs and reducing greenhouse gases,” Murray said. As for a high-speed San Diego to Vancouver run, Murray said not to dismiss it out of hand. Patty Murray is fantastic, and if she says to not dismiss it out of hand, I won't. But I'm going to remain highly skeptical. Especially since I'd be a frequent user of a West Coast HSR route. I just came back from a weekend in Seattle, and as someone with friends and family in that town and in Portland, I'd love a faster and more reliable way to get there and back via train. But I'm not convinced this is a particularly high priority for us right now. My own conclusion is that my views all along have been right: that we must first focus on building HSR in the key corridors, and then work on upgrading passenger rail between states and regions. A Eugene-Redding HSR line would come at the end of a national passenger rail project and not at the outset. Something I'd envision for 2050, not 2030. NOTE: The Blogger service will go offline for approx. 10 minutes at 2:00AM on Monday, May 11 for scheduled maintenance. We apologize for any inconvenience. On Friday, the business section of the Arizona Daily Star published an article on a high-speed solar train, proposed as Tucson-Phoenix connection by Solar Bullet LLC, a two-man outfit in Tucson that doesn't appear to have a website with this single-page web site (h/t to Adirondacker). Neither the proposed route nor any description of the ROW issues/environmental impacts to be addressed are provided. The picture shows a three-car train, which implies frequent but expensive service. The catenaries lack support structures, but at least this image shows the tracks at grade. The author appears more focused on using photovoltaics to power the train that it is on the train itself. Judging by the comments, this idea has been floated before but somehow never died. This is remarkable/suspicious given that the estimated price tag for the first segment of approx. 115 miles is a whopping $27 billion! The solar panels above the tracks would not come cheap, especially given their proximity to the overhead wires and exposure to aerodynamic forces plus vibration every time a train runs past. However, the artist's rendering also shows an aerial structure with a wide gravel bed at grade. It's possible the artists was clueless, cp. the short length of the train, but a picture does say more than 1000 words. There are few major roads between the metro areas, so why not use the gravel as ballast and switch to aerial alignments only within the relatively populated regions. Proponents are touting quad tracks so express trains can operate at 220mph, which requires 25kV AC. Note that the artist's rendering is plain mendacious in that it shows just a single track. No speed was given for the local trains, but with just six intermediate stations 150mph peak should be entirely feasible. Apparently, no-one considered if overall train frequency would justify even sidings at the intermediate stations, never mind dedicated super-express tracks. Back in 2000, the Tucson metro area has 843,746, while Phoenix counted 3,251,786. The metro area added around one million residents before the real estate bubble burst and is now in modest decline. The problem for any HSR project is that both cities have little or no connecting public transit. The sprawling metropolis of Phoenix has a grand total of one light rail line and has to resort to an artificial Copper Square umbrella brand for a $3 billion development effort aimed at creating a mixed use neighborhood that is intended to give the city a recognizable downtown area. Downtown Tucson is also a branding effort rather than the result of decades of planning designed to create a shaded, walkable urban core. Tellingly, the site provides not a map of downtown but of its parking amenities, including numerous multi-story car parks where commercial or residential real estate could have been if public transport had been a priority. It was only in 2006 that residents decided to tax themselves to get streetcar service. Senator McCain's principled stance against earmarks may be laudable, but in times like these, it could also prove a liability: his fourth term is up in 2010. HSR between Tucson and Phoenix could perhaps make sense, but perhaps only as a dual-track rapid rail proposition with tracks mostly at grade and in combination with projects to expand local light rail and/or BRT routes, all at a far lower capital investment than is being touted. I'm not sure if it's the dry desert heat, but there are actually other projects that are partially disconnected from reality. For example, DesertXPress will apparently use a near-invisible overhead wire that needs neither catenaries nor poles. The roof panels above an air-conditioned 21-mile bike path in Qatar are held up by a tangle of pipes carrying expensively refrigerated cold water, presumably to keep cyclists from suffering heat stroke. Note that the artist for this project also forgot support columns. 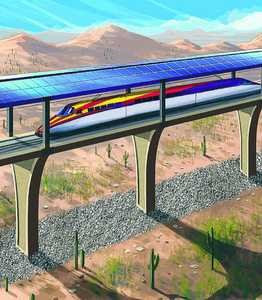 While I'm all for greener forms of transportation, especially electric trains and (electric) bikes, the Arizona Solar Bullet project in particular does the cause of getting HSR off the ground in the US no favors at all. In spite of criticism of the way certain CHSRA board members and staff have led the California HSR project in recent weeks and months, it is undeniable that the 10+ years spent on environmental and technical studies was not wasted. Not only do none of its renderings defy the laws of physics, the per-mile construction cost forecasts in e.g. the Central Valley are also an order of magnitude lower than the $237 million advanced by Solar Bullet LLC for the Arizona corridor. Indeed, the average for the entire 450 mile starter line from SF to LA and Anaheim, including several expensive mountain and fault crossings plus busy rail traffic at either end, is currently estimated at $73.3 million per mile. There are good reasons why Secr. of Transportation Ray LaHood thinks California is far ahead of every other HSR project in the country, perhaps even including the still-stalled effort in Florida. Plus, CHSRA has decided it wants the high-speed network in California to run exclusively on renewable power, i.e. a reliable combination of wind, solar and geothermal, possibly assisted by hydro and biogas. However, the Authority has wisely left the implementation details to the experts in the utility sector. Today is National Train Day, and although I'm up in Seattle for the weekend, there are a number of California events going on today that you might find worthwhile. The CA events are mostly oriented toward Amtrak, but we support all passenger rail at this site, and these events are open and welcoming of high speed trains. After all, Amtrak does operate the only real high speed train in the country! The main event is at LA Union Station. There's live music, train displays, including of historic passenger rail cars, galleries and exhibits - including one called "Trains Move Our Economy". The Coast Starlight is also participating in National Train Day, with a group riding Train 11 from Emeryville to Paso Robles and back - you can follow their activities on Twitter @CSCN, and the Twitter feed for National Train Day is @trainday09. There are events at several stations along the route, and elsewhere in the state - find more by clicking here and scrolling down to the CA section. RailPAC has more as well. Transportation Secretary Ray LaHood singled out California and Florida as leading candidates to secure federal funding for high-speed passenger-rail service. California is "way, way, way ahead," he said. As for the Midwest, where many officials are hoping to place Chicago at the center of a high-speed rail network stretching to St. Louis, Minneapolis, Cleveland and Detroit, Mr. LaHood said, "They're not in that position yet." That's certainly more welcome news than I was expecting. I'm sure that the Midwest states, which are extremely important politically to President Obama, will have something to say about this - but even if they are able to wrangle more money out of the USDOT process, it's not going to be a whole lot of money. LaHood is clearly signaling that California is positioned well to get a big chunk of that federal HSR money. 1. The entire Los Angeles-to-Anaheim and San Francisco-to-San Jose corridors, where the Authority is expected to have completed the project level environmental document, and qualified and selected design build teams to begin construction of the sections by the 2012 deadline. 2. Identification, selection and negotiation of right-of-way acquisition in the Merced- to-Bakersfield section, including the system’s planned maintenance facility. Authority staff also will work before the deadline to identify other “shovel ready” projects outside the three corridors identified above that advance the Authority’s high-speed rail plan and that meet the federal criteria, according to CHSRA Executive Director Mehdi Morshed. Unfortunately it's not clear what the specific projects will be - the CHSRA press office didn't have that information. So to all you who think I never criticize the CHSRA, here you go - they really need to get that list of proposed projects out to the public. That will help make the project tangible and show exactly what the stimulus money can bring. It can help rally the public to support HSR and those specific projects. Still, in the overall picture this is a welcome development and a sign that the federal government is quite serious about giving the California HSR project a major financial boost. Given my own rather strong opinions on the topic I felt it made sense to take a step back and assess the big picture of the HSR battle on the Peninsula. I know I'm more strident on this than even many other blog readers and HSR. But my assessment is that in arguing that HSR would "harm" cities, the opponents of HSR have allied with people who aren't HSR deniers but who don't really take the project seriously or don't see its importance to their cities' futures, and by doing so have successfully built a coalition that threatens the HSR project itself. 1. The notion that HSR will damage the cities is powerful, if not based in either evidence or common sense, and creates a strong motivation to ensure the project is either killed outright or severely damaged by not including the SF and Peninsula on the route. It's not easy to talk rationally with people who are certain that a project is the infrastructural equivalent of a "Death Star". The "Berlin Wall" frame is effective at mobilizing city officials to try and compromise the project. 2. Despite the statewide public support for the HSR project, the backing of prominent statewide political leaders and even President Barack Obama for HSR, the Peninsula NIMBYs actually have more political power than the CHSRA and Caltrain regarding the Peninsula corridor. This is because the cities are coalescing into a tunnel-or-nothing bloc whereas there is no countervailing force in the Bay Area to systematically push back against their arguments and claims. The prominent politicians, for their part, are not that interested in this level of detail. You're not likely to see Barack Obama go to Palo Alto and chide the NIMBYs for blocking 21st century progress, as wonderful as that would be. You're not likely to see Gavin Newsom go to Sacramento to lobby State Senators to ignore the NIMBYs, even though that's a necessary move if he wants his Transbay Terminal to include HSR. And as we know, Arnold Schwarzenegger doesn't care about the details of governance, since he merely plays a governor on TV. Instead the legislative debate appears dominated by people whose commitment to HSR is weak at best, like Alan Lowenthal, or who are unwilling to stand up to the NIMBYs, like Joe Simitian. 3. The CHSRA has few defenders and many detractors, and the Peninsula NIMBYs are effective at mobilizing a FUD (fear, uncertainty and doubt) campaign. I am not a blanket defender of the CHSRA, but I do believe that even HSR supporters aren't really aware the extent to which their own criticisms of the CHSRA are used to support a NIMBY attack. It's easy to paint the CHSRA as a typical "big bad bureaucracy" but to do so is to miss the point entirely. I would strongly suggest that the legitimate criticisms of the CHSRA - and there are many - be made with care so that they don't wind up bolstering the NIMBY cause. 4. A tunnel is not going to happen. It is financially impossible. Neither the federal government nor the state government will contribute a dime to it. And when push comes to shove neither will Peninsula residents be willing to tax themselves to the tune of tens of billions of dollars to underground the HSR trains from Belmont to Palo Alto. Yet the NIMBYs have done such a good job of convincing their fellow residents of point #1 that lots of residents and councilmembers see a tunnel as the only viable implementation of HSR along the corridor. Since a tunnel isn't possible, I am very concerned that the cities will revolt against HSR itself when the CHSRA rejects a tunnel, causing many years of court delays that could hurt the project's ability to be properly funded. I also believe this is the heart of the Martin Engel/Morris Brown strategy in the aftermath of their failure to stop Prop 1A in November. 5. As someone pointed out in the comments to one of the recent posts, cities talk to each other. If NIMBYism is able to exert power over the final project design of HSR on the Peninsula, that emboldens similar forces in the Central Valley and Southern California. What happens on the Peninsula is precedent-setting. In short, I think the NIMBYs are filling a power vacuum on Peninsula HSR that is created by the lack of strong leadership for the project either in San Mateo County or in Sacramento. That in turn leaves me very concerned that a political deal could be cut to preserve the HSR project by cutting it off at San Jose, which for reasons I've articulated before, would do severe damage to the financial viability and overall effectiveness of the project. So ultimately I find myself in disagreement with those who claim that the Peninsula NIMBYs are overblown and not really a threat to the project. I think they are an extremely serious threat and I believe we ought to find ways to defuse that threat. I'm also open to new suggestions of how to accomplish this - my stridency may not always be the best solution. 1. Provide high-profile responses to the NIMBY arguments whenever possible. Ideally this would involve getting prominent political leaders who support the HSR project to participate in the process as they can garner TV news coverage. In most reporting I've seen, the NIMBY position is given prominence merely because they're organized and have locally-based leaders who can speak for them, whereas the only pro-HSR side tends to be the CHSRA, which is not preferable since they must maintain neutrality, and because they do not have a strong local base (that's not really their job anyway). 2. Specifically, promote local pro-HSR voices. 65% of San Mateo County voters backed Prop 1A. That's a large pool of support for this project. We need to find ways to amplify their voices, and thereby show that the NIMBYs are working counter to the will of the majority of Peninsula residents and to the detriment of those residents' ability to take meaningful action on global warming, traffic, energy independence and economic recovery. 3. Undermine the "tunnel or nothing" position. Point out early and often that a tunnel is going to be extremely expensive and that the Peninsula will have to pay for this on their own. CHSRA must be neutral on this during the project-level EIR process, so someone else will have to make these points known. Show that the NIMBYs are proposing a Bay Area Big Dig that the Peninsula cannot afford. Nothing undermines a position like pointing out its inherent fiscal irresponsibility. Note that this doesn't mean we attack the concept of a tunnel, but instead those who argue it must be a tunnel or no HSR at all. 4. Undermine the "HSR will destroy our cities" narrative. Much of that narrative is based on deliberate distortions, such as the "Berlin Wall" propaganda that has been shown. CHSRA hasn't been quick enough to produce alternative modeling to show how an above-grade solution can be elegantly implemented, though we have explored that topic here. We know that the "city-killer" claims are absurd and baseless. We have to more strongly make that argument by showing how above-grade HSR will help improve mobility, connectivity, and safety in these cities. 5. Remind people of the ultimate purpose of HSR. Saving on gas money, reducing traffic, fighting global warming, boosting mass transit, creating jobs, etc. How it connects to longstanding local priorities to improve Caltrain service, and local support for Prop 1A. This is probably best done in a positive way with the general public, but in a more antagonistic form with the NIMBYs - i.e. "why are you against" all that I just mentioned. It's a question of leadership and public advocacy. It's time we offered both.